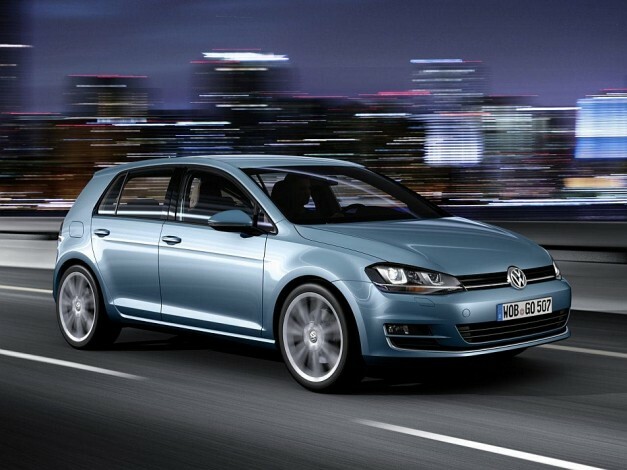 The introduction of the first 2.0l diesel into the Golf saw the first DPF strapped to a Golf exhaust. 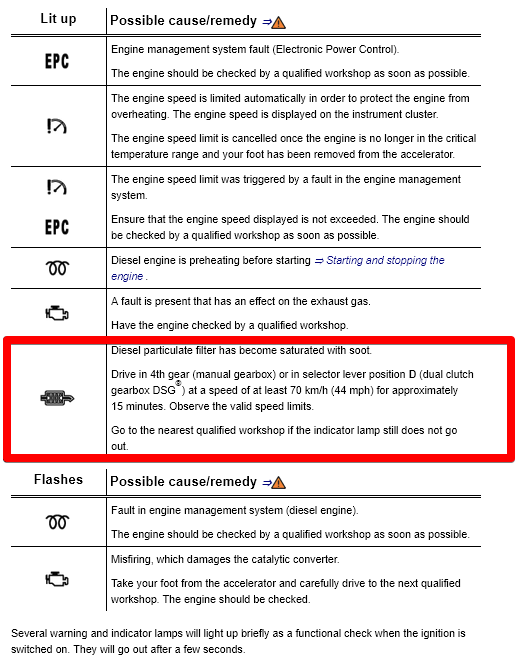 The internet suggests that the 1.9l diesel engine was still available in the MK5 but seems to have escaped the DPF due to it’s amazingly low emissions figures – it was also only a 1.9l. Unfortunately, we’ve been unable to locate a MK5 Golf Owners manual on the old interwebs. Please do get in touch if you have a copy and can send us the dash warning light and DPF information. For now we’d recommend using the MK6 information as a guide. Sorry! We’ve been much luckier in finding information about a how to perform a DPF regeneration in the MK6 Golf. See below images and extracts from the online owners manual. Drive for approximately 15 minutes in 4th gear (manual gearbox) or select D (automatic gearbox) at a speed of at least 70 km/h – 45 mph). Please observe any applicable speed limits. If the indicator lamp still does not go out, go to a qualified workshop. 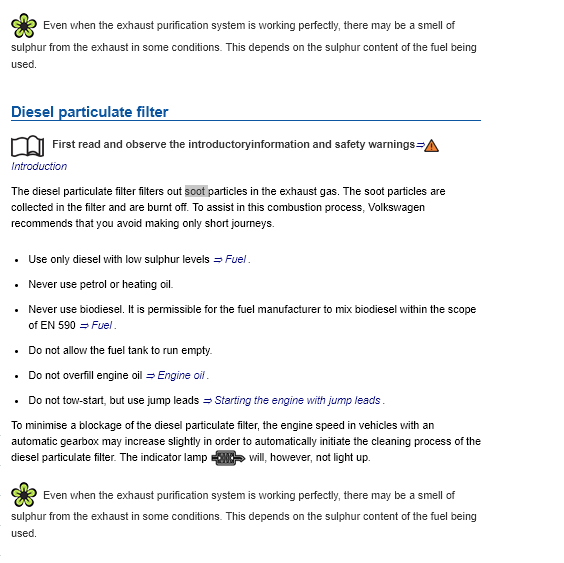 The diesel particulate filter filters out soot particles in the exhaust gas. The soot particles gather in the filter and are burnt under high temperatures periodically (regeneration). Heat produced can warm the engine. Regeneration can cause noises, light smells and delay in radiator fan irrespective of the outside temperature, even after the engine is switched off. 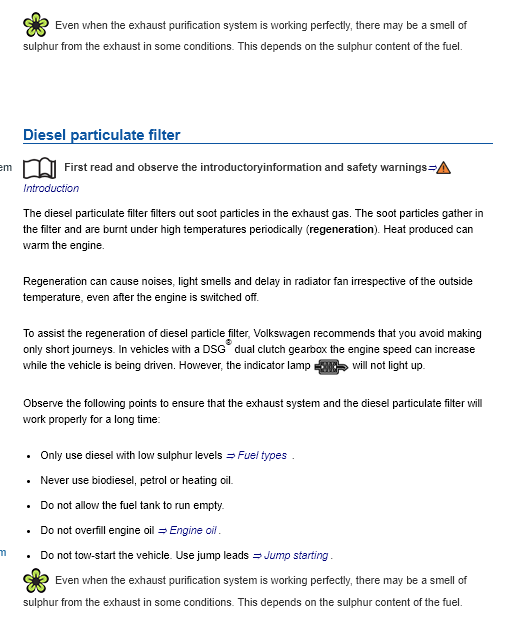 To assist the regeneration of diesel particle filter, Volkswagen recommends that you avoid making only short journeys. In vehicles with automatic gearboxes the engine speed can increase while the vehicle is being driven. However, the indicator lamp will not light up. Only use diesel with low sulphur levels ⇒ Fuel . Never use biodiesel, petrol or heating oil. Do not overfill engine oil ⇒ Engine oil . Do not tow-start the vehicle. Use jump leads ⇒ Starting the engine with jump leads . The information in the MK7 owners manual was updated very slightly with the MK7. In fact a regeneration can take place a whopping 1MPH less than in the Mk6. It also gives mention of the DSG gearbox available in the Golf. Diesel particulate filter has become saturated with soot. Drive in 4th gear (manual gearbox) or in selector lever position D (dual clutch gearbox DSG®) at a speed of at least 70 km/h (44 mph) for approximately 15 minutes. Observe the valid speed limits. Go to the nearest qualified workshop if the indicator lamp still does not go out. To assist the regeneration of diesel particle filter, Volkswagen recommends that you avoid making only short journeys. In vehicles with a DSG® dual clutch gearbox the engine speed can increase while the vehicle is being driven. However, the indicator lamp will not light up. Only use diesel with low sulphur levels ⇒ Fuel types . Do not tow-start the vehicle. Use jump leads ⇒ Jump starting . Even when the exhaust purification system is working perfectly, there may be a smell of sulphur from the exhaust in some conditions. This depends on the sulphur content of the fuel. If your dash is showing the dreaded DPF warning light then it’s going to be one of two things. Either your DPF pressure sensors has failed or your DPF has clogged up. If you’re unlucky enough for the DPF sensors to fail then we’d suggest reaching out to the VW forums or a friendly garage for assistance. 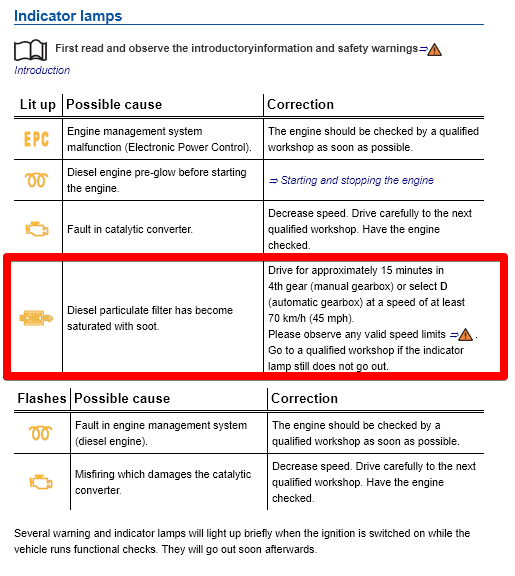 If it is the DPF at fault, you’ll be wanting to carry out the instructions as per the owners manual above. You might also consider a DPF cleaner to help speed up the DPF unblocking process. DPF cleaners work by reducing the temperature at which the soot can be burnt off ridding it of its sooty contents much easier and at lower exhaust temperatures. Please be aware that ANY cleaning or regeneration process will not remove the Ash content from your DPF, it will ONLY burn off the soot. Golf diesels beyond the MK7. You’ll have probably heard (and maybe agree) that diesel has had its heyday. The effects of diesel gate and the diesel emissions crack down in capital cities across the world has demonised the old oil burner, sending sales and confidence plummeting. This combined with VW’s decision to stop developing it’s diesel engine line up gives a pretty big indication that future generations of the Golf i.e. the Mk8 (2020) will see only Petrol, Hybrid and full electric power plants beating inside their engine bays. The move over to cleaner burning fuel is certainly a good thing, however there will always be a loyal diesel following who will continue to pine for the high compression, low running costs and super efficient engines powering their VWs of the past. Unfortunately for them, and within our life time, we’ll see diesel passenger cars disappear from showrooms for ever. Do you have a Golf DPF cleaning / regeneration tip that we’ve missed? How reliable has your Golf diesel been? Have we messed up or made a mistake in this article?